RACHEL: It’s time to start the next project. It’s actually past time, as the people who give advice about writing and publishing seem to be in agreement that writers are supposed to be working on the next project before the current one is published. So I’ve already missed the first deadline. I have tons of ideas, but where to turn at this time? Since this is really Veronica’s space, I thought I’d let her share her opinion. VERONICA: Well, naturally, I’d love to see more writing about us Caryatids. Tell about the ways we’ve adapted to survive, and the birthing of babies, and the Goddesses who watch over us. You could tell about the Deva that lives in Melch’s hill, though he’s not strictly a Caryatid, but he’s a neighbor and integral to our larger community. Here’s an idea: a collection of short stories, each named for a Goddess, and each about a different character, and how that person embodied some qualities of his/her respective Goddess. They could all be interwoven, and maybe altogether they’d show the character of the community, moving through some particular period or event in the life of the group, or the place. STARLA: I think your idea about conspiracy theories and mind control and the healer talking to aliens is cool. And all the links to external sites. You and Kevin would have a lot of fun collaborating on that project. MELCH: That one would be an opportunity to explore some essential questions about knowing and consciousness, how we judge information, the nature of reality. But your reservations, Rachel, might be well-founded, that your novel-writing skills may not be developed enough to pull this one together. You’ll have many years to write, what’s the rush? Why not tell us more about Starla, and her history? Apparently she’s not going to tell us on her own. STARLA: Don’t listen to him, you can do anything you set your mind to! Though my story is pretty juicy . . . .
CAL: What about me? You left me in the middle of a flood. C’mon, I’m a great character. Admit it, you liked writing me. Don’t you wanna know happens to me, after Maeve– well, okay, I won’t spoil it. But seriously, think about it. About me. CHELSEA: You all make me sick, with your me, me, me. I’m going to tell you something about ME. I’ve been languishing on Rachel’s mental back burner since before she even met some of you, trying to hold things together in this bleak wintery world, while the men are hiding from environmental estrogen in their cushy underground bunkers, leaving the women on the surface struggling to survive on turnips and peas and whatever we can barter, while Granny Rachel (yes, one and the same) rocks in her chair, blathering on about the old days and how the rumble of cars on the highway never ended, people paid for their lodging with money that you could take to Emporia and use to buy foods from anywhere in the world. Well, Rachel, write me or don’t. Won’t change a thing either way. RACHEL: Oh Chelsea, I’m so sorry you feel that way. Everyone else, thanks for your input. Shall we open it up to our readers? 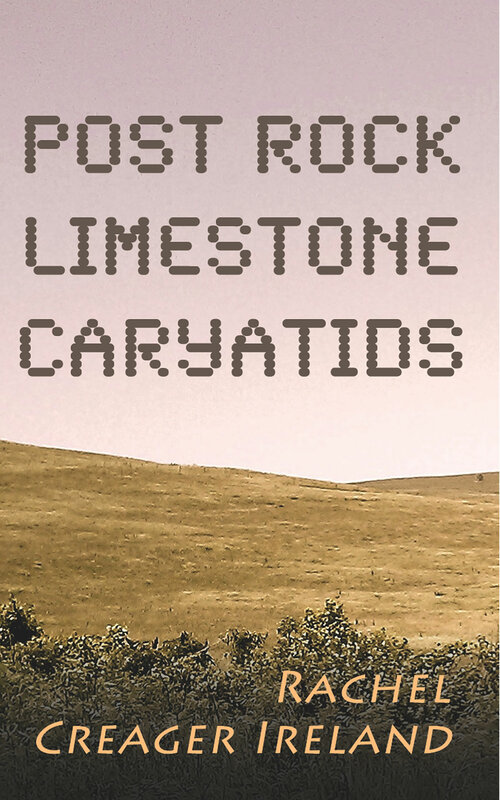 Rachel would like me to announce that Post Rock Limestone Caryatids has been uploaded to Bookbaby! In a few days or a week, perhaps, our story will be available for purchase on Amazon, to be followed, as speedily as they operate, by, oh, you know, all the other ebook retailers. Needless to say, we are all very pleased that she has finally followed through on her promise to us, to tell our stories, to . . . oh, I’ll leave off for now the metaphors of fertility and fecundity, and we’ll simply celebrate. It’s done! Hooray! Here’s a part of Post Rock Limestone Caryatids that Rachel decided to cut, believing that it did not advance the plot in any significant way. (Never mind that she sometimes wonders if the same could be said of every part of the book, and wondered if on this ground she ought to scrap the whole thing.) Oh Rachel, are we nothing more than automatons, bound to carry out the machinations of your imaginary plot? She assures me that she does care deeply for us, begging my pardon that she admittedly cares for her biological children somewhat more. No matter, Maeve gets plenty of exposure in the book, but hasn’t had a lot here at Veronica’s Garden. Rachel may not have time for this bit, but I do. That side was made for you and me! She didn’t know what it all meant. She had to look up Woody Guthrie, who apparently had some connections to Communists. So was he making a comment on the ownership of private property? Looking around her, seeing the horizon in all directions, a couple blue jays squawking at her, the question of whether anyone could own all this seemed moot. Strange to think of a Communist who loved freedom so passionately. She looked up “relief office.” It probably didn’t have anything to do with stress relief. . . . Maeve breathed a little sigh of appreciation when she found that Jabar had thought to upload an encyclopedia of history, one of his favorite subjects. It turned out that there had been a massive effort on the part of the United States government to alleviate the economic disaster of the Great Depression, which effort appeared to focus largely on banking, labor, and housing regulations and subsidies, but also fed people soup and employed them doing work that no one else wanted to pay people to do. What an interesting idea. The thought of government establishing programs with the sole purpose of helping people in need was completely foreign to her. She couldn’t figure out whose interest would be served by that. In the end she could only conclude (based on the limited information available) that someone (Franklin Roosevelt? the general population?) simply didn’t want people to starve, or to be left out in the cold. It wasn’t a satisfactory explanation, but it was the best she could come up with. The rhythm of the song was good for walking, though. She listened again and again, until she thought she could hear that voice rising up from the earth. This land was made for you and me. She thought she was on a long walk, but Woody Guthrie had walked so much more. She wondered if she would ever see those redwoods, or the sparkling desert sands, and what it had been like to see IRL those iconic features of this vast continent, on which she had spent so many years in a tiny dark room. Rachel insists I add that, from her research, she believes that no one has a copyright claim on this song. If you believe you do, for heaven’s sake, please just tell us and we’ll remove it, and make our readers go to wikipedia for the lyrics. For everyone else, we hope that you read the whole song. The best verses are the ones most people don’t know. What will become of us? Our author has not opened our file in weeks. We thought it was because of the holidays, but they are off in the world of memory now. She has perused blogs about publishing, ignored offers of connection with some published novelist somebody knows, started a new blog with an intentionally limited audience. We see her daily work at clearing emotional baggage, as well as struggling to clear unnecessary material possessions. Then she gives in to obsession with the latest Dan Simmons novel, which she got for Christmas. Oh Rachel, will you ever fly over your unseen obstacles, like Aenea and Raul Endymion and A. Bettik paragliding over the cloud-obscured boiling acid ocean of planet T’ien Shan? Will we, your characters, your alter egos, your virtual children, ever be liberated from your private files? Will the Post Rock Limestone Caryatids, the Winnies, the Sisters of the Star, the squatters of Manhattan, Kansas ever see our stories told? Will Maeve Wolf, Starla Winnie, Valeriana Glitch, Melchisedek Weaver, and Cal see their names printed upon a page? She appears to be waiting, but no one is sure for what. We wait too.